The ISS is getting an incredible new tool: a handheld DNA sequencer. The questions scientists hope it will answer include whether life exists beyond our planet and just what is that weird fungus growing on the wall of the space station? The biomolecule sequencer, called a minION, will be part of the cargo that SpaceX will launch to the ISS on Monday. Once it arrives, the newly arrived ISS astronaut Kate Rubins will use it to attempt the first in-space DNA sequencing. We talked with the NASA scientists—Camille Alleyne, Aaron Burton, and Sarah Wallace—behind the project to find out what else it could do, both right away and in the future. 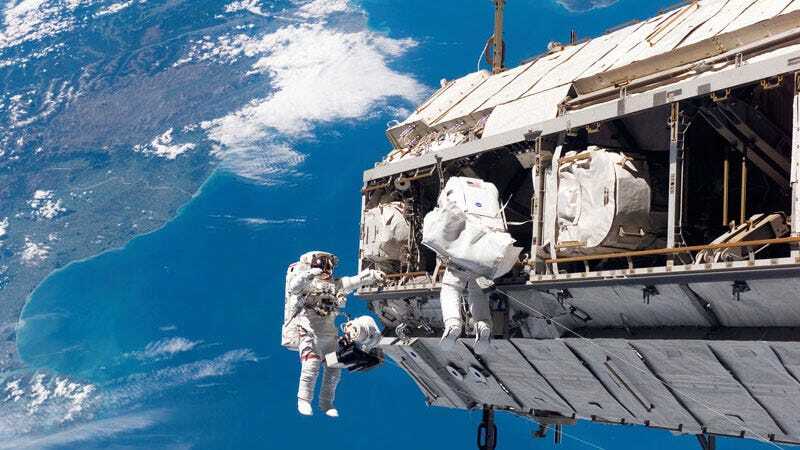 As a self-contained unit with a rotating crew of astronauts, a constantly changing cargo hold, and all the microbes that have ever accompanied them, the ISS is a microbial stew. One task the researchers hope he sequencer can accomplish is investigating exactly what’s floating around the station. Right now, if there are questions, the only way to answer them is with an old-fashioned culture test in a petri dish. But the sequencer could answer questions, especially about the air and water, almost immediately. Simply being able to monitor the air and water quality in the moment would be a big step. But there are also some unexpected questions that arise on the ISS that the sequencer can answer. For instance, the matter of a weird fungus that astronauts keep scrubbing off the wall—but no one has quite identified yet. The sequencer could also answer questions about the long-term impact of living in space on the human body, or even someday be used to diagnose astronaut illnesses, as they move towards longer stays. But the real applications of the sequencer might only be seen once its off the ISS and going out further into space. The researchers hope to someday use it to identify life—in practically real-time—on other planets, including Mars. Of course, that life could take multiple forms. It would be very useful to see what kind of life we’re dragging along with us when we visit, whether ourselves or via our robot rovers. But another extremely exciting possibility would be finding life that’s native to other planets. The researchers are already looking at how the sequencer could be modified to deal with truly alien life—for instance, life that didn’t even have DNA. While some of these applications are in the distant future and far from our home planet, the basic research the astronauts hope to do could also easily come closer to home. The ISS (a remote, minimalist environment, by necessity) also functions as a good template for how to conduct operations on remote areas of Earth. But having a working sequencer in space also opens up new laboratory possibilities that could fundamentally add to the way that we understand genes and their workings—and that’s knowledge we can apply here at home. For now, though, the sequencer’s first project is simply to see if it can perform as well up in space as it does here on earth. Once they’ve got a benchmark, then the real work can begin.